NFL Sunday AFC Divisional Free Play, Courtesy of Tony George Sports, Pittsburgh @ Chiefs. The ice storm is hitting Kansas City on Saturday and Sunday (I know because I live here) and this game was moved to 8:20 EST on Sunday to accommodate the KC fans to fill up Arrowhead where the Chiefs lie in wait for the Steelers who embarrassed them earlier this season in Pittsburgh. Rest assured the fan base will be good and oiled up and near riot stages for this huge game in Kansas Cit, where the field will be covered until late Sunday afternoon when the storm passes. No doubt the public is going to love the Steelers here, and according to Matt Holt, COO of CG Technology in Las Vegas, head of 7 books, this is a Pro’s versus Joe’s game all the way in the amount of bets tallied to date. This just in, the sharps love Kansas City and the public loves the Steelers. No surprise there for anyone who follows the Las Vegas perspective. Kansas City is a complete team, perhaps one of the most complete teams in the NFL left standing in terms of offensive balance, Special teams, defense, coaching and other intangibles. Andy Reid is 19-2 SU off a bye week the last 21 times that scenario occurred. 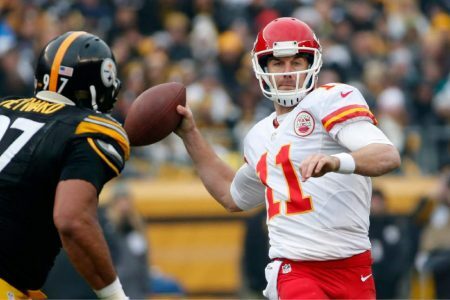 There is one big elephant in the room in this game, and it pits QB Alex Smith of Kansas City against Big Ben of the Steelers, and there is no doubt Big Ben is the better QB, but how healthy is he? The Steelers running game with Bell has been devastating to opponents and the Steelers are on a roll coming in here, but how bad is Big Ben’s ankle is a huge question mark. His success throwing to WR Brown and a host of other studs, is the fact he buys time my moving around in the pocket and making big plays down the field. That is a KEY in this game, because Kansas City can flat out get after a passer. Another key is the fact Pittsburgh turns it over, and Big Ben does force the ball, and Kansas City is one of the best in the NFL with gather turnovers (33 defensive takeaways) and they thrive on this aspect. The other big intangible here, which is a huge tangible item in my opinion, is the play of Kansas City’s special teams, and their return game with rookie sensation and play maker Tyreek Hill. Anytime Hill has the ball in his hands it is calling all cars alert for opposing teams because he can take it to the house on any play. Add in a Pro Bowl Punter and great kicker and KC has an advantage there as well. Also in play here is TE Travis Kelce, who is the second best TE in the NFL behind Gronk. He can line up in the slot, and is a huge issue for any defense to handle. At days end I am siding with the sharps in this game, because their are so many small advantages that line up in Kansas City’s favor here at add up to an advantage I cannot ignore, and no doubt the home field here is worth 3 points as Arrowhead is one of the toughest venues in the NFL to play in, along with Seattle. Alex Smith does not make mistakes and can manage a game, and KC has a ball hawking secondary and offer explosive plays on special teams which gets field position for a very balanced offense. While Big Ben is dangerous and has vast experience in games like this, I feel this is Kansas City’s game to lose, and with an added week of prep, revenge and the better coach, I am laying the small number here, current -1 on the Las Vegas Board. NFL from Tony George on a 41-19 Against the Spread run, multiple weekend cards in NFL and CBB is up and ready, come cash them all out (CBB 7-2 run) !